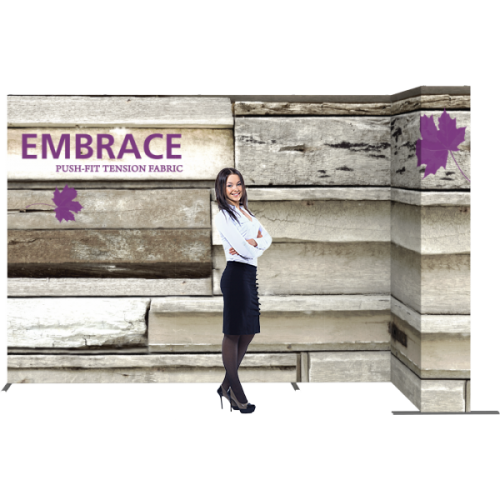 This 10ft wide Embrace™ booth is an L shaped left corner popup display popular at trade shows and conventions. The popup frame is an expanding frame with channel bars that have recessed grooves to accept the SEG graphics. The graphic is printed dye sub on SEG push-fit fabric, we offer with or without end-caps. We suggest using endcaps for a more finished look. The Embrace is easy to setup, the frame is collapsible and portable. This corner backdrop offers an easy and tool-less set-up. Two wheeled carry bags are included for easy transport and storage. Embrace 30ft Full Height Push-fit Tension Fabric DisplayThe Embrace™ Mega 30ft straight backdrop dis..